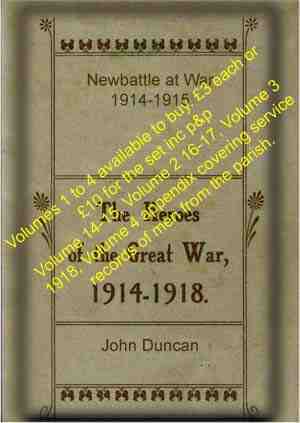 of Newbattle during the Great War. men service records or details of service. previously unpublshed photo and various other sources. this adds another to the growing number of heroic lads form this district who have cheerfully and gallantly laid down their lives for their country. Several local lads have arrived home from France, among others being Charles Bowers, Loan Road; Thomas Wylie Dean Park and James Wright, Fourth Street. They are looking extremely fit and healthy, and have expressed their thorough determination to see this struggle brought to a victorious end. Mr and Mrs James Thomson, Loan Road, received intimation on Monday that their son, Sapper William B. J. Thomson, R.E. had been killed in action in France, on 27th December. The officer in charges writes to Mrs Thomson, dated 29th December,1915. Or direct from myself if you live locally. To obtain details on how to order books please use the form.